Our loss may be your gain! If you have been following our newsletter over this past summer, then you may know that we have had a comedy of errors in getting our new books printed. And it hasn't been that funny either! Our latest debacle is that our revised edition of The Shaping of a Nation - Blackline Maps of American History arrived with the wrong cover. Now when I say the wrong cover, I do not mean that the text or graphics are incorrect. It is the finish on the book that is wrong. This newly revised 2007 edition was meant to be a slick gloss cover that would coordinate with the other map books that we carry, but a mistake was made at the printing manufacturer and it arrived with a matte (or dull) finish. In the end, we decided that it was important enough for us to have the books reprinted with the correct covers. What does this mean for you? We are slashing prices dramatically to get these misprinted books out of our warehouse and into the hands of those that appreciate a GREAT DEAL. These books are in perfect, brand-new condition! Here is our offer... we will give you a free 128 page book of Blackline Maps of American History when you purchase the CD-ROM of the same title. A total of 113 maps that you can use while studying American history. By the way, the Blackline Maps of American History CD-ROM has been revised as well (as of last month) to match the contents of this book, so you can print out multiple copies of the book from the CD-ROM for multiple students within your family. Do you already own the revised American maps CD or simply prefer to use the book as a consumable without the reproducible CD-ROM? We are selling copies of this book - original retail price before revision was $24.95; revised price will be $29.95 - for just $5.00 plus shipping and handling. At this price, you can purchase 5 for the original price of a single copy. Stock up on these for your school, classroom or co-op. And while we're at it, we decided to put our other American history books and products on sale as well. If you are studying American history this year, this is a great time to stock up on some of these resources. I can not foresee that the prices will be any lower later on in the year. This American history sale will last through next Tuesday, September 18th! Buy the CD-ROM for $19.95 and get the 128 page book free! The original retail price for this book was $24.95, but you can get this book free when you purchase the CD-ROM of the same title. When the correctly printed books arrive from the printer in about 1 week, the new retail price for this volume will be $29.95. The Blackline Maps of American History CD-ROM is identical to the book for printing multiple copies for multiple children within your family. The books and CD-ROMs are in perfect brand-new condition. Again, there is nothing wrong with this book in terms of content, text or graphics. The finish of the cover is matte (dull finish) instead of gloss. Would you rather just buy the book as a consumable without the CD-ROM? Stock up on these for your school, classroom or co-op for just $5.00 each! While we're at it, we might as well put some of our other American history products on sale so that you can benefit from some truly excellent resources for your studies. The State Book retails for $18.95 and the workbook for $34.95, but when you buy them as a set today, the price is only $43.90 for the pair - $10 off. That's a 20% savings! Your students are learning so much history, but do they have a place to record it all? Wouldn't it be nice to have a timeline book where all of this information can be compiled beautifully in one place? When completed, it becomes a treasured keepsake! 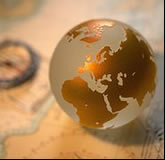 Wonders of Old is divided into four historical time periods: ancient, medieval, new world and modern. Significant dates are listed at the conclusion of each section as a helpful reference. Wonders of Old on CD-ROM. Give your child the gift that will become a keepsake when the rest of the school books and projects are long since a memory. Build a timeline book together with this CD-ROM. Read more about this here - Wonders of Old. Let's say your friend plays Tennessee. What do you do? If you have a state card which borders Tennessee, play it! 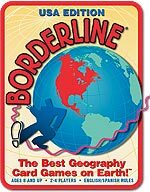 If you have a BORDERLINE® USA wildcard, play it and call it any state in the lower 48. Or you can try bluffing! Maybe your friend doesn't know that Texas doesn't border Tennessee! The mini-map makes is clear! Does Arizona border the Pacific Ocean? If your friend plays Canada on South Dakota, is he bluffing? You bet! Challenge him! Leave text books and workbooks aside and bring your child right into the adventure with hands-on projects in every lesson! Each lesson begins with a briefly written Lesson Text followed by activity choices to reinforce the topic. Choose the activies that work best for your family! Also included are Project Pages providing directions, supplies needed, and illustrations for each of the projects. A Photo Gallery also offers a visual aid of the final outcome of the projects. Beautifully detailed Masters are provided for all printable projects! The Project Pages will provide printing instructions. Five "Project Days" are built into the schedule to help allow for extra time to complete outstanding projects. Teacher Helps include tips for preparing and organizing, as well as a resource list of books, videos, audio suggestions, and websites to enrich your studies! A one-page Lesson Plan Schedule gives you a "guide-at-a-glance," allowing you to see the whole schedule of upcoming topics and projects on one page. $28.95 each. Buy all three and get free Priority Mail shipping on these items! Have a great 2007/2008 school year! P.S. Don't forget that this sale will only last through Tuesday, September 18th.